you block unwanted thoughts on the green. Your mind can play havoc with your putting. Unless you can control what goes on in your head, you are potentially a putting cripple. Every time you play golf, you are in reality playing two games – a physical game and a mental game. Each plays a part on how well you score on the day. This is because both games are interconnected. Putt with assurance and your mind won't bombard you with constant unhelpful messages. Allow fear and anxiety to creep in and your mind will make the physical side of holing a putt an impossibility. The difficulty with putting is that you have to initiate the action. 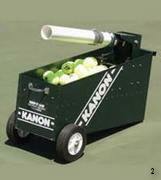 Now imagine there was a ball machine similar to that used by tennis players. The equivalent putting machine would roll the ball to you and you would then hit it back towards the hole. Because you are now reacting to the ball, there is no time for your mind to work against you. The physical game of putting is the easiest to learn. The mental game of putting is a bigger challenge. This is an area where most golfers struggle. This technique programs you to think positively. Like it or not there is a ongoing stream of chatter in your head going on in the background. It is like radio static. When this interference is negatively charged and in the foreground, your ability to putt successfully will suffer. In order to block out any destructive thoughts, you repeat to yourself positive statements such as 'I'm a good putter, I'm fabulous on the green' and so on. The idea behind swing thoughts is to keep you relaxed and focused on one aspect of your putting stroke. For example, you may repeat over and over a swing thought such as 'Keep your Head still' or a simple word such as 'smooooth'. Typically you can only focus on one thought at a time. By occupying yourself with a swing thought, you prevent other thoughts from entering your mind. Clear Keys are the brainchild of Carey Mumford. They are different to swing keys as they are not action-related. In this technique you either count random numbers, recite a meaningless phrase in the context of putting such as 'Mary had a little lamb' or even sing under your breath. In this way you distract your mind from conjuring up thoughts that are potentially harmful to your putting. A number of tour professionals use this approach. Once you step into the ball, it is one look at the target and then you putt without delay. You simply don't give your mind time to be filled with negative thoughts. It is based on the putting drill of 'Look and Shoot' devised by Dr Bob Rotella (with Brad Faxon) in his DVD of Putt to Win. This quick putting routine takes some practice as the temptation is to look two or more times for added assurance. Putting is 85 to 90 percent in your head. The more interference you have to deal with, the worse you will putt. Once you have a good grasp of the physical game of how to putt, quietening your mind becomes the biggest challenge to further improvement on the green. This is where Putting Mind Games can help.